The Five People you Meet in Heaven is a novella roughly around 120 pages and I have no clue as to what genre to put it under. Anyway, for starters, I would say that I picked this book as a light read during a short travel that I undertook and yes, I have never completed a book in its digital form and I thought this would be a decent start. While I am not a subscriber to the concept of life after death and in fact, I don't agree with a lot of things the author has talked about, in this book but then, I would not let my personal opinions influence the review of the book. The story is about a maintenance worker at an amusement park, named Eddie, who is not too satisfied with his life and felt he was stuck doing mundane things and never lived to his potential. At the start of the book, he was living his last moments and dies to protect a young girl from an accident in the amusement park. 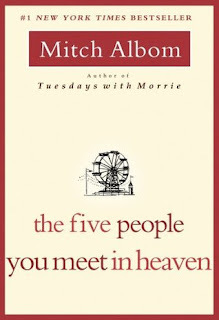 He then goes to heaven, meets five people, each of whom, have had some impact in his life, directly or indirectly and the book is about his journey in heaven. I liked the first meeting in heaven, where the author brings out how there might be people whom you come across, who seem so insignificant, but you've had a huge impact in their life and you aren't even aware of it. The central theme of the book was the fact that every event in life has a purpose and every person in the world has a person and no life is ever wasted and the author brought it out well through the five people. Anyway, with that said, I felt after a good start, some of the other four meetings was not as impressive, predictable or totally random. Sometimes, the simplicity of the language could be a strength but I felt the narrative here was a way too simple and I sometimes felt that was a turn off to an already short book. Moreover, I felt the story need not have gone back and forth between his birthdays during his days alive and life after death and in fact, I didn't even find a point in why those birthday bits had to come in, perhaps an attempt to take the book beyond hundred pages. I found a lot of negative reviews on this book, but then, I guess it is a problem with expectation more than the book; I merely wanted a light read for a short journey and this book delivered what I wanted and my suggestion is, don't read this book looking for some great underlying story or philosophy, just a light read with some interesting bits. In fact, I feel this book is very similar to that famous book by Richard Bach; Jonathan Livingston Seagull - owing to the popularity of the book, I had huge expectations on that book but then, I found it a way too horrible that I gave it a very bad review, three years ago. While this book is similar to Jonathan Livingston Seagull, I find this to be a much improved version of the same and while in Jonathan Livingston Seagull, I had perhaps set the wrong expectations; here, I got what I wanted, as I already said, earlier. So, on the whole, purely considering my own experience with the book, I give the book a six, provided you, the potential reader also have an expectation similar to that of mine.